We recently became aware of a powerful tool for the streaming radio broadcaster and listener alike – streamWriter the streaming radio recorder. This tool allows you to record and archive your own radio shows or record a radio show on another station for later listening. Have a favorite London dubstep radio show that is only on Friday nights? Don’t like having to listen at 4am? Just use this tool to record and “time-shift” the show so you can listen at your convenience. Pretty cool! To use streamWriter you need to have the streaming URL of the shoutcast server for the radio station you want to record. 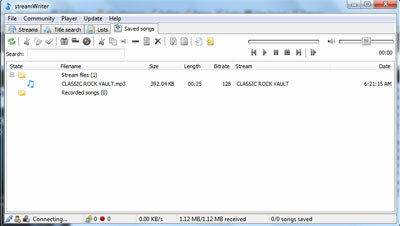 For our demo we used the stream from The Classic Rock Vault – http://199.180.72.2:8194. Once you enter that into streamWriter it automatically connects to the stream and starts recording. It’s that easy! If you don’t want to record the show right away you can right-click on the station and just “play” the stream until you hit the record button. 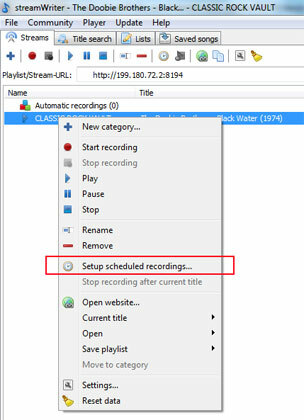 To schedule a future recording just right-click on the station name and choose “Setup scheduled recordings” to pick a time range – save the scheduled recording and it will run automatically… just make sure you leave your computer on! Another great feature is that streamWriter allows you to record only certain songs with certain titles from the streams you choose. When that song starts up – streamWriter automatically starts to record it. Just add that song title in the “wishlist” area of the application. We are very impressed with streamWriter and have added it to our Streaming Radio Toolbox that no broadcaster or listener should be without. Developed in Germany by Alexander Nottelmann – we look forward to seeing this tool grow and expand – there are also German language packs if you Sprechenzie Deutsch. Download streamWriter for free here and please let us know what you think about this tool. When you launch your radio station you will be eager to attract new listeners and engage your audience. Nothing is more rewarding to a broadcaster or a D.J. than hearing your listeners love the music and programming you are selecting. Some stations set up a chat application on their sites where DJs can interact directly with their listeners – this is great real-time feedback and certainly fun for both broadcaster and DJ. Most stations set up a contact form where listeners and others can get in touch with compliments, complaints or (many times) spam. If you have followed our advice in our previous social media tips for radio stations posts then you have a twitter account and facebook account. You can look at your number of followers on twitter and the number of members / likes your facebook page has to get an idea of your reach and reputation. But there is another tool we can use to monitor how your station is seen, shared and mentioned out on the web. Google Alerts! Google Alerts offer an easy way to get notified if any search term you choose is newly added to their index – you can be the first to know if someone mentions your radio station on their blog, in a comment or anywhere else on the web. 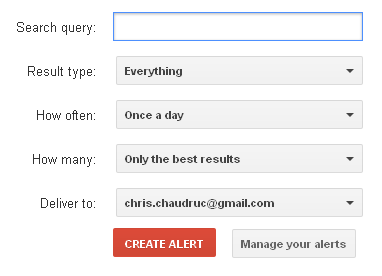 If you don’t have a Google account – you will need to get one to leverage Google Alerts. Visit this page to get started. Configure the alerts to monitor your station name – if you have a long station name then choose several alerts to cover all the options. You can always disable alerts if you are getting duplicate results. That’s all for this installment of social media tips for your streaming radio station. In part 1 of this series we discussed using facebook as a tool to push visitors to your radio station. Setting up a facebook page for your station allows a station manager to network within the facebook environment and generate new listeners and visits for their online radio station. And adding facebook “like” widgets to your radio station site will help visitors “vote” for your site by liking it and thereby promote it to their facebook networks. Part 2 of this series discusses twitter and how a station manager can use it to gain listeners and visits. If you are not familiar with twitter then you might want to read this article – twitter is a micro-blogging platform that allows people, web services and applications the ability to convey 140 character messages about what they are up to now. There are two main ways a radio station can use twitter and each requires its own twitter account. So head on over to twitter and sign up for two different accounts. The first account will contain a stream of your ‘now playing’ song titles that will update as songs change in your broadcast. This will be populated automatically by a php script – details below. You can call that “station name_nowplaying”. The other account is a more custom news stream from the station that will allow a station manager to promote station artists, events and contests. Few twitter followers will want to be updated on *every* song you are playing and will sometimes unfollow you as the song stream data can be annoying and clog their stream. By having this second account set up – a follower can still get good news and updates from their favorite stations without having to get song by song updates as well. By splitting these up – we make sure your news and retweets and recommendations do not get lost in the ever updating stream of now playing song title tweets. • You can set up multiple accounts on each and easily manage them on the same screen. 3. Upload title.txt, twitter.php, EpiCurl.php, EpiOAuth.php, and EpiTwitter.php to your webserver IN THE SAME FOLDER! Both scripts came from the shoutcast community and any questions can be posted here in the shoutcast forum. In closing – use twitter to follow radio stations, internet radio news sources and artists you like. Post your own news on twitter to keep your followers up to date on your news and set up a second twitter account to link in to your shoutcast “now playing” data. Next time we will discuss twitter techniques and marketing ideas to help attract new listeners and keep your current listeners engaged. This post is meant to be a starting point for discussing some of the techniques that internet radio stations can use to harness the power of social media to drive traffic to their site and listeners to their streaming servers. This is not an exhaustive list of techniques – but this should be a good starting place for a radio station director or manager. Although these steps take time and each one of them requires some ongoing management time – you can be sure that each step will give you more exposure and in turn will lead to more listeners and visitors. Let’s start with the social media darling – facebook. It is a very good idea to set up a fan page for your radio station on facebook. This would be a different account from your own personal account – trust me on this – it may seem like an easy thing to just create a page using your personal account but you will want to keep things separate down the line. 1) Create new facebook account for your station manager “persona”. 4) On the next screen you are asked to choose a community page or official page – since you want to manage this 100% choose “official page” and name it in such a way that it describes your radio station. So many people think the world knows what “B96 FM” means. It doesn’t mean anything. BUT “B96 FM – Dance Hits and Top 40 – Chicago” says a lot more. Be descriptive with your page (and station) name. 5) Fill in all of the information about your radio station. And this is important – create a logo image. Don’t use that header image – don’t make the text unreadable – hire your graphic designer back and pay them $50 to do this the right way. You get a 200×600 logo and it will be cropped to 50×50 for your posts. Here is a good article that discusses how to create a good logo for your streaming radio station. 7) The “facebook badge” will display the status of your group – a short description of the group and your logo image as well as the number of fans. There are a lot of options available for the badge but we recommend using the “Add a link box” code instead of badge code if you just have to pick one. 8) The “linkbox” will add a “like” button and a photobox of all people who like your station – very easy to use – we recommend this one if you just have room for one on your site. The like button is a way for people to “vote” for your radio station. This concludes part 1 of our facebook tutorial for internet radio stations – think of facebook as another receptor for listeners to join your station. Looking ahead to part 2 we will discuss twitter and how to use that with your radio station – this will include a set of scripts that will read your server “now playing” data and update your twitter feed with that information. usually free and allows you a lot of freedom to configure your station the way you want. In this tutorial we will go over the setup of our own radio station. dubradio.servemp3.com. Just a quick overview of how I set up my internet radio station. Zara Radio – my audio “player” a radio automation software package allowing me to queue up songs – ads – teasers and jump in with the MIC whenever I want. And the price is nice at FREE. UltraVNC is used so we don’t need a monitor hooked up – I can use remote desktop to manage my radio station box hidden on my bookshelf – makes it nice to stash away on my bookshelf. noIP.com to map a domain name ( dubradio.servemp3.com) to my computer – I have cable so my IP address is dynamic – the noIP.com service sends a ‘heartbeat’ signal that detects when my IP address changes – if it changes they re-route incoming traffic to my NEW ip address. Pretty coo! lightHTTPD for Windows – a light webserver to serve up your radio station web site. PHP – a dynamic programming language module because I love PHP. ClamWIN anti-virus to keep the radio station box clean and that’s about it. Except for the HP e-PC all of the above is free. But please – donate to the projects to keep them alive. Here we are again with another great Holiday season upon us. Nothing makes you feel the Holidays more than great holiday music – Christmas Carols, Hymns, Songs of Praise and Worship and fun secular songs like “Grandma Got Run Over By A Reindeer” and “Jingle Bell Rock” set the holiday mood. This year we are showcasing some of the more unique Holiday Radio Stations available streaming online. From classic carols to twisted Christmas to Gospel Reggae Christmas. So check out some of the stations below – sign up for a FREE listener account – and save the stations you like in our preset widget for easy listening throughout the holiday season. Comments are open for this post – so please add any other Christmas and Holiday Radio stations below…. Welcome to Happy Christmas Radio, the biggest Christmas themed radio on the Internet. Come and celebrate Christmas with us. We play Christmas songs, back to back, 24/7. You planned a Christmas party, but forgot all about the music? Not to worry. Just tune into Happy Christmas Radio and enjoy the music. We offer you and your guests the most appropriate musical background. Want to create that Christmas atmosphere at home or in the office? Don’t look further. Tune into Happy Christmas radio and there you are. Celebrate Christmas from a simpler time! Old Time Radio Christmas features shows with air dates ranging from the early 30’s to the mid 60’s. you’ll hear Jack Benny, Bob Hope, Bing Crosby, Lucille Ball, Red Skelton, George Burns & Gracie Allen, Milton Berle, Fibber McGee & Molly, The Great Gildersleeve, and tons of holiday suprises sure to bring a smile to your face. The Cutting Edge-Where Jesus, Santa and Alternative Rock meetup and jam! We play Christmas radio and Humour radio. Posted on November 14, 2010 November 15, 2010 Categories christmas and holiday music6 Comments on 10 Free Christmas Radio Stations – Free Holiday Streaming Radio!